Being at your local bar may not be what you consider an ideal place to find love. But someone is there who knows a lot when it comes to dating – your bartender. It may be a good idea to get dating advice from the bartender. The people serving the drinks sees and hears it all, and knows what works and what doesn’t work when it comes to pick ups and hook ups. Your bartender can be a great resource for getting some dating advice and here’s why. Yes, you may have been in the same bar with the bartender plenty of times. However, the advantage the bartender has is that they are sober while you’re not. They are also there a lot longer and get the chance to see people flirting with and otherwise trying to pick up people all the time. Essentially, they know what works and what doesn’t work. They can tell you the ways to help make sure you don’t go home alone and get the person you are attracted to. Bartenders know the places to go to find singles. They might also know a group of people that it might be worth you getting to know and where you could find someone with common interests. They also oftentimes get invited out to exclusive events or after-hours events, of which you may get to hear about by asking them for advice or getting to know them. In their line of work, bartenders get hit on all the time. As such, they usually have quite a bit of experience under their belt when it comes to dating. As such, they can usually give some sound advice as to what does and doesn’t work when it comes to dating. 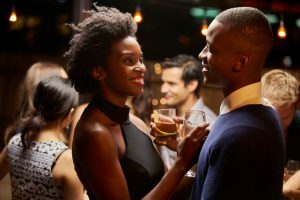 They may have even gone out with someone who frequents that particular bar which didn’t work out, but they feel might be a good fit for you. Asking someone for dating advice is, of course, flattering. So, asking your bartender can help earn you points with them; points which translate to you being prioritized during busy crowds. Getting in good with the bartender is always a good thing which can earn you some benefits. If you build a strong enough rapport, they may even introduce you to one of their own friends or available customers! Again, remember that bartenders run with large social circles, so it’s definitely a possibility! Sure, you can search the web for dating advice, but most of that is either trying to sell a book, or ends up being things that sound good in theory, but don’t exactly work out the same way in the real world. Bartenders tend to have hands-on experience – something far more valuable than what looks good on paper. So, give it a try! See what advice your local bartender has for you next time you’re out. You just might be surprised.